Alhama de Murcia has five districts, split in high districts: El Berro and Gebas, which are located in the northeast foothills of the Parque Regional de Sierra Espuña (Sierra Espuña's Regional Park), and low districts: El Cañarico, Las Cañadas and La Costera, located right on Guadalentín Valley. It is located in the heart of Sierra Espuña, 14km from Alhama and at about 600 metres above sea level. Through Calle Mayor you come to the parish church of Nuestra Señora de los Dolores, blessed in 1868, which stands next to the Cerro de la Molata (Molata's Hill). It has a rural hostel, and a camping site with swimming pool, camping plots, and wooden houses, increasing tourism, especially in summer time. In addition, tourists can enjoy various dining establishments to taste the typical Murcian and local gastronomy. The local patron saint festivities in honor of La Virgen de los Dolores are held in August, and the whole town comes out to the streets to celebrate. We recommend a visit to the Mirador del Sagrado Corazón (Sagrado Corazón´s Viewpoint), from where one can get a beautiful view of the entire town and of the Barranco de El Berro (El Berro's Hill). On January 6th takes place the performance of the Auto de Reyes Magos (The Three Wise Men Auto Sacramental), where the main actors are the residents of El Berro. It is located 9 km from Alhama and it is the least populated district. The Inmaculada Concepción´s hermitage can be found in town, built in 1893, and in her honor the August 15th holidays are celebrated. Gebas stands out mainly for the Protected Landscape of the Barrancos de Gebas (Gebas's Gullies), the terrain features and water erosion have shaped a landscape attractive for visitors. We recommend a visit to the Mirador de los Barrancos de Gebas (Gebas' Gullies Viewpoint), from which one can observe the abrupt geomorphological composition formed by the spectacular gorges, and from which we observe the Rambla de Algeciras, which runs an intermittent water course that turns the riverbed on a walk sprinkled with natural pools and reeds. Nowadays, Gebas is the main core where the municipality's rural accommodation options for tourists concentrate, and where you can also enjoy the services for nature lovers and tourists. It lies on the northern slope of Carrascoy Regional Park and it is the furthest district from Alhama (17km.). Its inhabitants are distributed between the "Venta de los Carrascos" and "Pueblo Nuevo". Los Saladares (Salt Marshes), along Guadalentín's river bank, is another reference visit to admire the vegetation landscape in the area. Paragliding from the Solana de la Sierra of Carrascoy is very popular, with a smooth flight and landing near the Murcia's road MU-603. 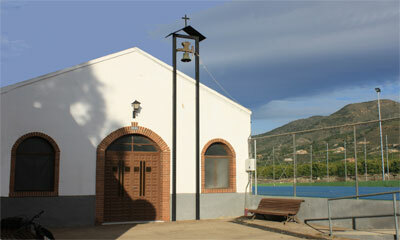 It is located 6 km from Alhama, in the northwestern slope of the Sierra de Carrascoy. Its territory includes part of the natural landscape of the Saladares del Guadalentín (Guadalentin's Salt Marshes). Worth seeing, Torre de Inchola (Inchola's Tower), very deteriorated, example of Moorish architecture of the 13th century. There are rural accommodations, horse riding and traditional Murcian places to eat (rices specially recommended). There are rural accommodations and traditional Murcian places to eat. Of interest is the Church of Nuestra Señora Virgen de La Cabeza in La Molata, built in the 18th century, the atrium has been fittedand restored in December 2010. Its front reproduces the ancient ocher facades of houses in the area. The San Francisco de Asís hermitage in Los Muñones was built in the 19th century. Their festivities take place in April in honor of the Virgen de la Cabeza, carrying it in procession through the main street accompanied by the Municipal Band of Alhama. Los Saladares (Salt Marshes), in the area of La Alcanara, is a must visit for the interesting natural landscape. You can contact a Tourist Active Company to organise ornithological routes. There are rural accommodations available.